Minty Peach Lemonade is a tasty, refreshing drink combining classic homemade lemonade, mint simple syrup, and fresh peach puree…sure to become a new summertime favorite! 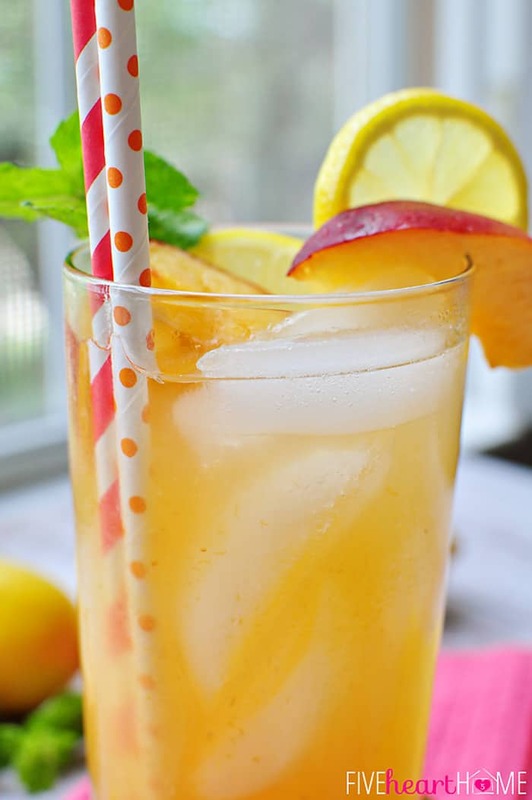 I am so excited about today’s recipe, y’all…I don’t know why peach lemonade never occurred to me before. Strawberry lemonade? Sure. Peach tea? Of course. But to take my favorite summer fruit and combine it with my favorite summer drink? Brilliant. I promise that I’m not trying to toot my own horn here. It’s just that this particular combo of flavors turned out to be really, really yummy. 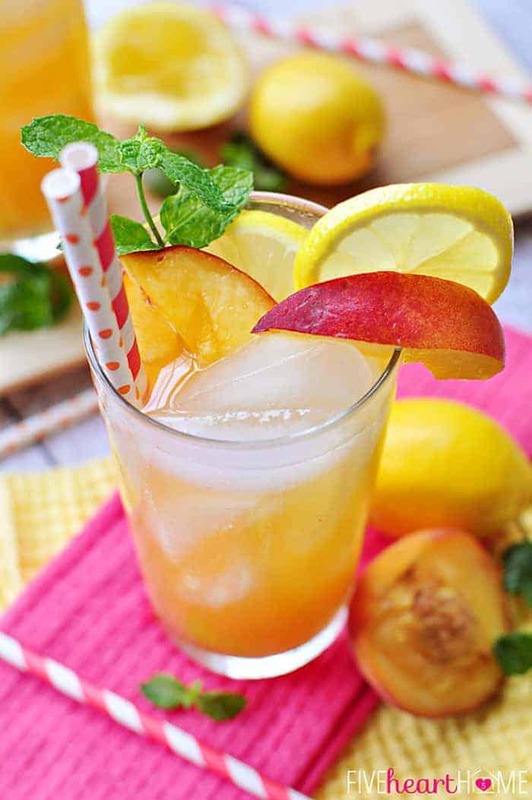 And that is due, in no small part, to the fact that this peach-infused lemonade also incorporates mint. There’s just something so delicious and so refreshing about adding mint to drinks, don’t you think? Whether it’s tea or punch or a cocktail, a little bit of mint packs a whole lot of flavor. My favorite way to use mint in beverages is to make a mint simple syrup with it. Unlike muddling your mint, making a simple syrup eliminates the concern of sucking up a fragment of a mint leaf through your straw. And I don’t know about you, but when I’m kicked back in my wooden rocking chair on my expansive front porch sipping on a tall glass of icy lemonade, the last thing I want to worry about is gagging on a mint leaf. Okay, so I don’t really have a wooden rocking chair. Or an expansive front porch. Or the time to leisurely sit and sip on anything. But a gal can occasionally daydream that life is like a lazy summer day on a Country Time Lemonade commercial, right? And if bickering kids or a toddler whining to be picked up snaps her back to reality a bit too quickly, she can just channel serenity for a moment longer by sucking down her Minty Peach Lemonade with a little more vigor. 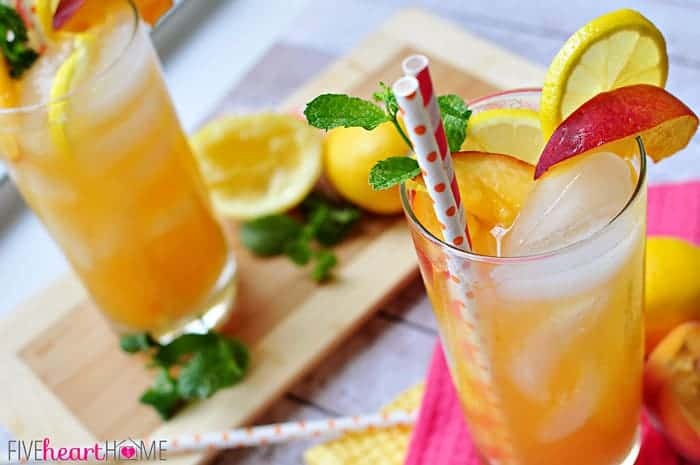 Minty Peach Lemonade is a tasty, refreshing drink combining classic homemade lemonade, mint simple syrup, and fresh peach puree...sure to become a new summertime favorite! Prepare mint simple syrup by combining 3/4 cup water and sugar in a small pot. Set pot over medium-high heat and bring to a boil. Stir until sugar dissolves and then remove from heat. Add mint and allow to steep until syrup has cooled. Strain and discard mint leaves. You should end up with a little over a cup of simple syrup. While syrup is cooling, wash peaches, remove pits, and cut in chunks. Puree peach chunks in a blender or small food processor until smooth. Set a fine mesh sieve over a bowl and pour in peach puree, pushing it through using the back of a spoon. Discard skins/solids. You should end up with about 1 cup of peach puree. 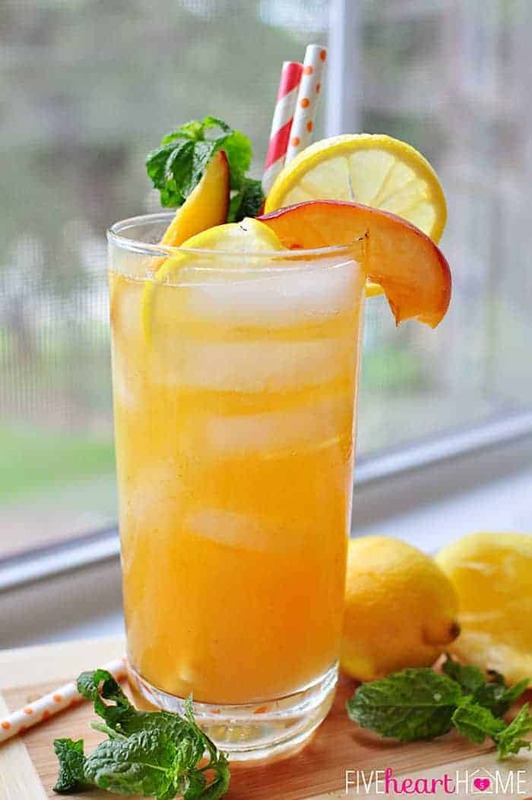 In a pitcher, mix together 1 cup mint simple syrup, peach puree, fresh lemon juice, and remaining 2 cups water (reserve any leftover simple syrup for another use). Refrigerate lemonade until chilled and/or serve over ice. Feel free to adjust this recipe to your taste, adding more water, lemon juice or simple syrup. This recipe can easily be halved or multiplied. Basically, you just need to use 1 part simple syrup, 1 part peach puree, 1 part lemon juice, and 2 parts water. This looks soooo good Samantha!!! Seriously love the flavors, the perfect summer drink. Thank you, Matt! I was so pleased by how well all of these flavors complemented one another. 🙂 Happy Friday! 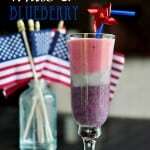 This recipe looks really yummy and refreshing. I’ve had peach lemonade but it’s artificially sweetened not with fresh peaches. Thanks for a yummy recipe! 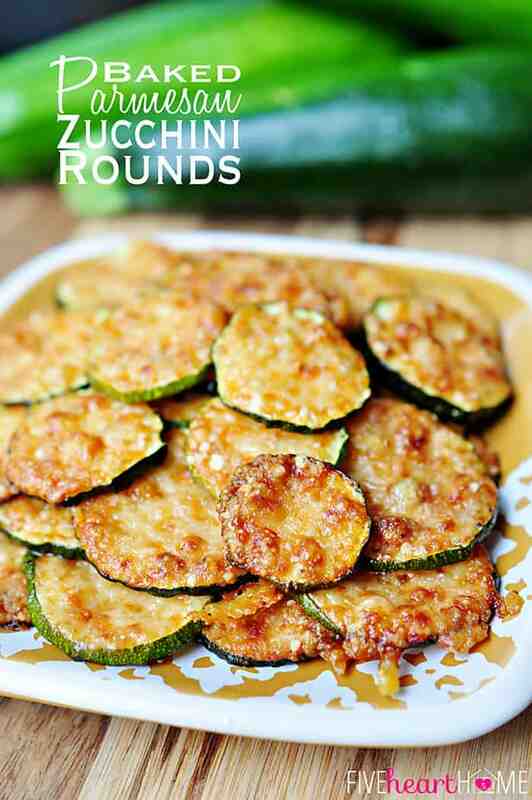 I’ve been blog-stalking you for awhile now, ha ha ha, and I just adore your recipes and especially your photography! It’s always refreshing (like this drink, har har har) to see someone with both culinary and photography skills. I’d love to have you link up with me at Three in Three for the Create & Share DIY and Recipe Party. I’ve missed you seeing your recipes since I left Tasty Tuesdays, so I hope to see you again soon! What a sweet comment, Karly…I love having blog stalkers – ha! 😉 Seriously, though, thank you for the kind words, and thanks for the invite to your link party. Hopping over now to link up! 🙂 I appreciate you stopping by and I hope you have a wonderful week! 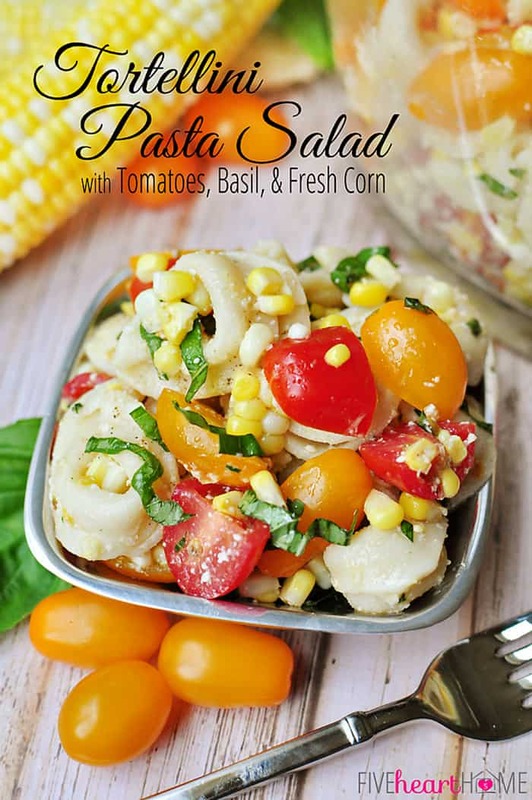 Amazing recipes for summer parties! i do lots of parties outdoors and its my favorite time of year! Love it if you come to my Fabulous Friday Party. I’ve got th porch; I’ve got the chair; I grow the mint. Now all I need is to take the time. Sounds like the perfect thing to dress us our 4th of July celebration. Thank you Samantha! So happy you stop by and the these photos of the drinks are amazing! i love photos that are crisp and clear.. trying to learn to be a better photograher. You are too kind, Maria…thank you! I feel like I still have a long way to go with my photography, but learning is half the fun. 😉 Hope you’re having a great week! Mint and lemon were just made for each other. I’m convinced of that this summer. I love the addition of peach too, one of my favorite fruits. I totally agree, Mallory…I love adding mint to just about every type of drink these days. It’s such a nice complement to lemon, and I think you’ll be pleasantly surprised by how well it suits peaches, too. 🙂 Enjoy! Hi again Samantha! Just wanted to let you know I featured your awesome lemonade this week! 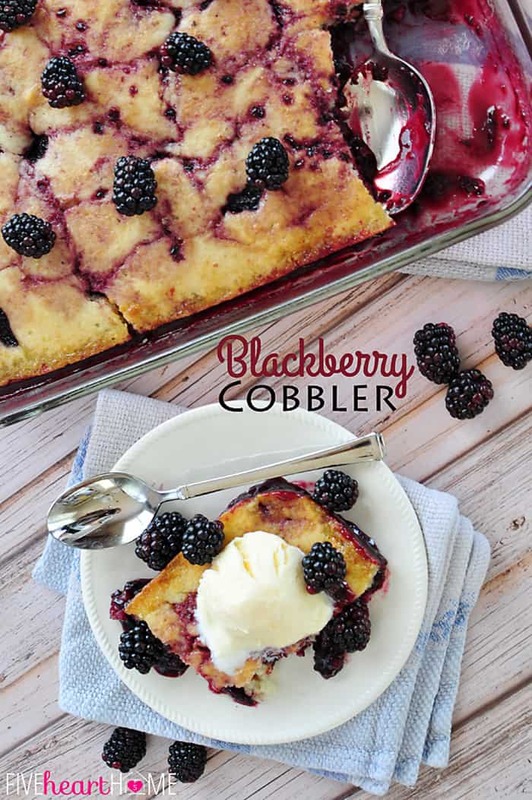 Thank you so much for linking up with me; I can’t wait to see what new deliciousness you have going on around here! Yum! This looks FABULOUS! I can’t wait to try out this recipe! Thanks for sharing on the Monday Funday Party! Looks stunning and sounds absolutely delicious. Pinned to try! 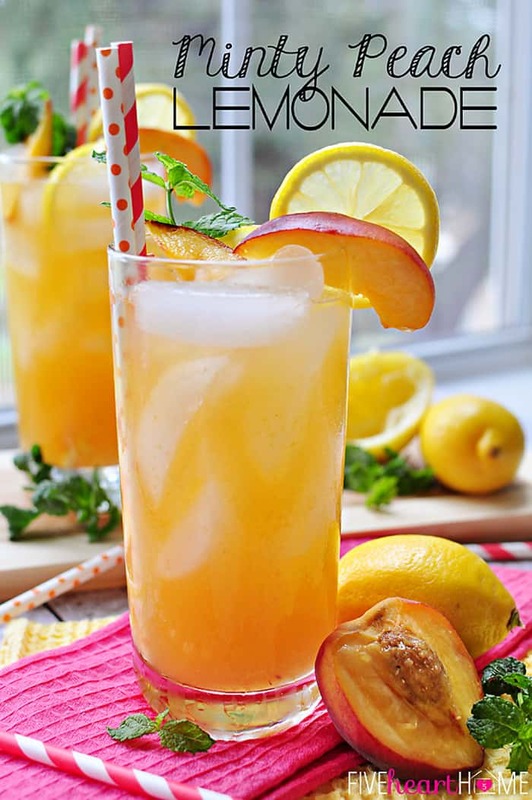 This lemonade looks BEYOND amazing! What an awesome flavor combo! Pinned! You are too sweet, Jocelyn…thank you! 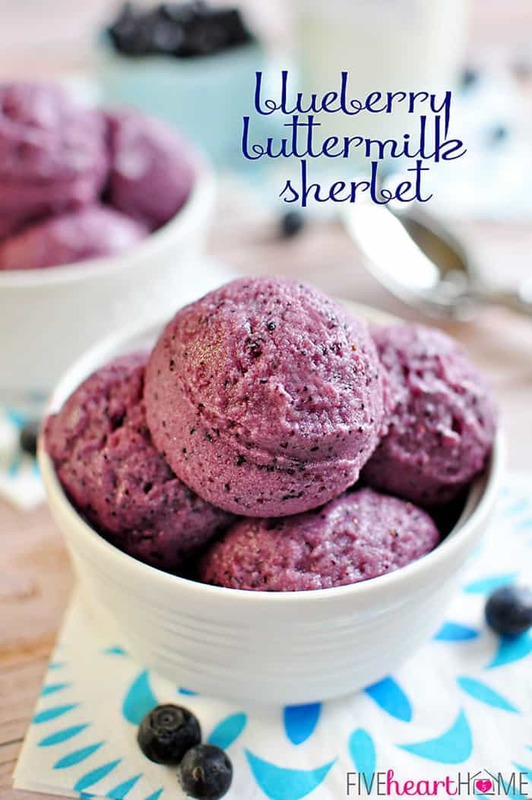 I hope you get a chance to try this sometime…it’s definitely refreshing for summer. 😉 Thanks so much for the pin, and I hope you’re having a fun and fabulous summer! Whoops, I need to proof read before I hit send! 😉 That was supposed to say “something”, not “so, etching”! Hello.! 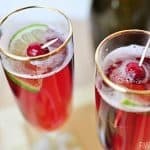 I tried this recipe for my best friends birthday last year and it was amazing.! I just have one question, can you use frozen peaches fr thus recipe.? Hi Brooke! I think frozen (thawed) peaches would work just fine in this recipe. They’re not always as sweet or “peachy” as fresh peaches, but I bet the lemonade would still turn out yummy. 🙂 Happy Friday!